This hand-made parts set is for the ECM Synchronika espresso machine. Each part is individually handmade using traditional workmanship. The set consists of 2 x steam / hot water valves, 1 x small brewing lever handle and 1 x portafilter handle. Made by hand custom ECM Synchronika Wooden Set. 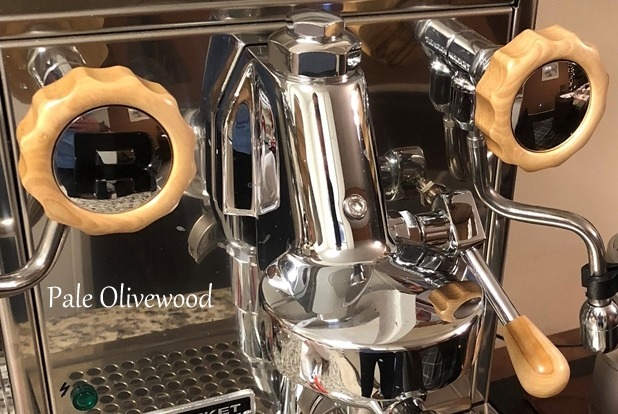 Consisting of 2 x steam / hot water valves, 1 x lever handle and 1 x portafilter handle. 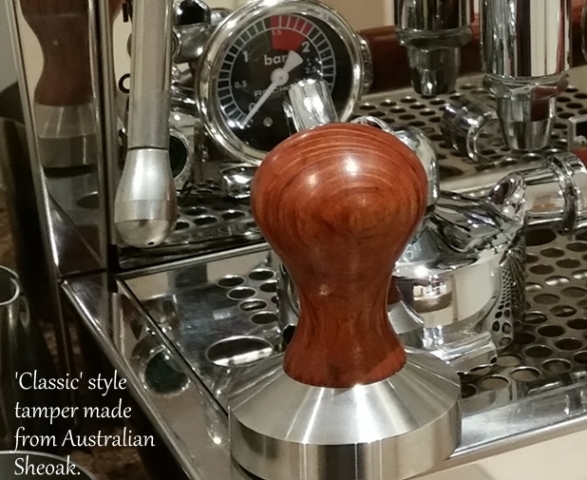 100% Australian hand made from native hardwood’s. We do not use any type of modern copy equipment. Instead all of our coffee parts are traditionally hand turned individually in small batches at our Perth workshop in Western Australia. We use a mixture of hand rubbed food safe, heat proof and water resistant oils. These oils are perfect to withstand the rigours of the coffee brewing environment. Much more friendly than artificial chemical finishes such as polyurethane. Our handmade coffee parts use sustainable or reclaimed natural hardwood’s sourced locally in Western Australia. We select all of our timber from specialist suppliers and only choose woods based on the weight, grain pattern and quality. For coffee part sets we use the same log to ensure consistent colour and curl in the grain. 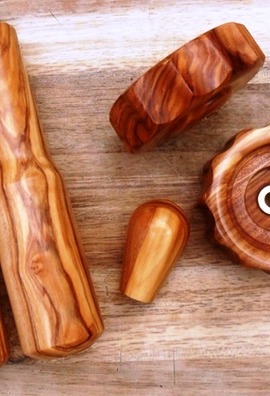 We also do our best to try and source other types of hardwood’s upon request. Every vivid swirling knot and sap hole tells the story of the tree’s growth and composition. To reveal the depth of hues and colours we use flowing ergonomic designs. Each coffee part set is made from robust figured hardwood’s designed to last a lifetime. Please check our current lead times here. We also occasionally have pre-made parts in stock. 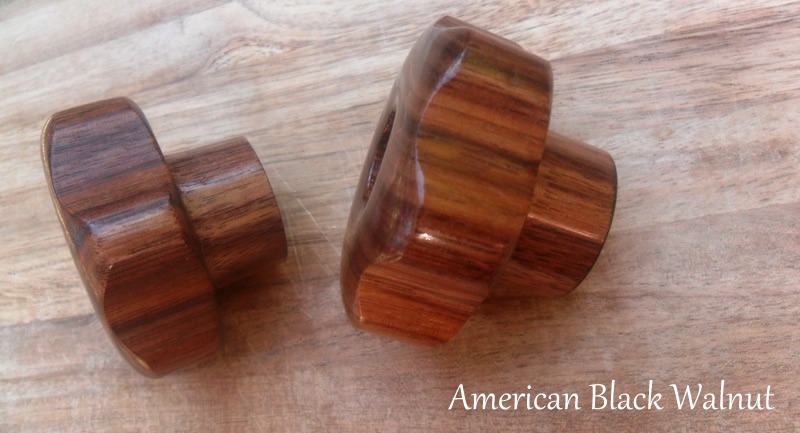 Our aim is to create the most extensive catalogue of handmade hardwood coffee parts available. Consequently, we regularly add new coffee part designs to our range. We can also custom make coffee parts in accordance to our customers specifications. Please contact us to discuss your requirements. 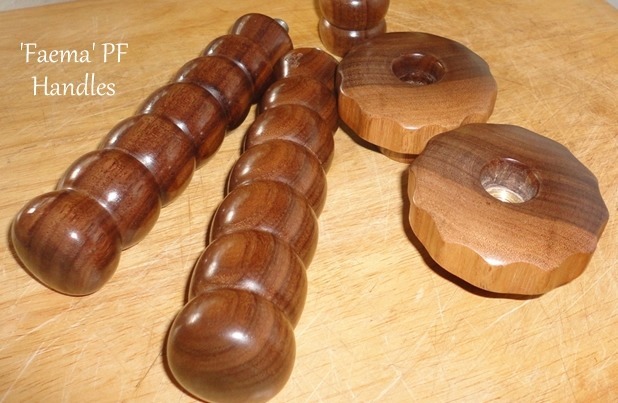 We often have handmade Part Sets for immediate shipment. Please check here. All of the coffee machine manufacturers use a thread locking glue on the black plastic PF handle bolts to prevent movement once they have been screwed into the group head. This glue can be softened with heat which will then allow them to be unscrewed easily. We recommend pointing a hair dryer (for 10 minutes) or heat gun at the section the handle joins the head and gradually as it heats up they will start to budge. They can then be turned off by hand with a damp towel on the group head or in a vice for better grip if they are stubborn. 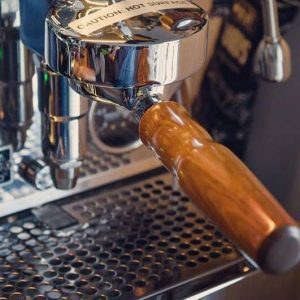 Our handmade Faema coffee portafilter handle has a fantastic grip based on the original Faema design. 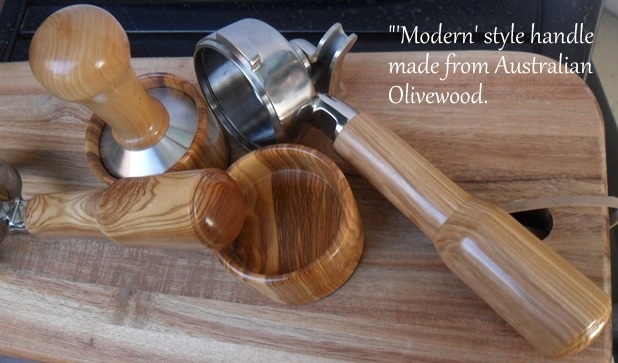 Each handle is individually handmade using traditional workmanship without the aid of modern copy tools. For added strength and weight they are hand tapped before being fitted with 9.0cm long stainless steel bolts. 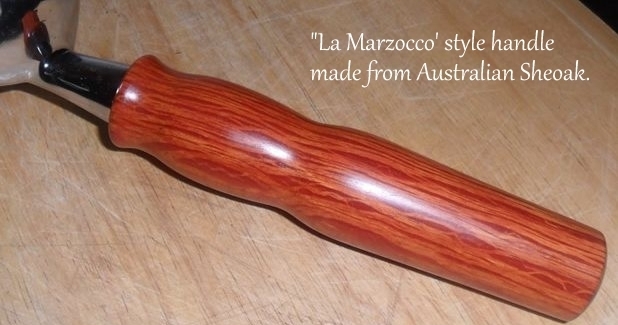 Our handmade 'La Marzocco' coffee portafilter handles have a slim line ergonomic design. 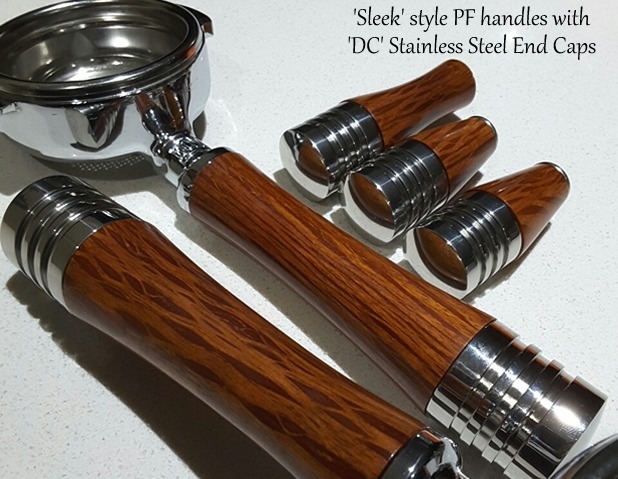 Each handle is individually handmade using traditional workmanship without the aid of modern copy tools. For added strength and weight they are hand tapped before being fitted with 9.0cm long stainless steel bolts. Handmade hardwood Rocket Cellini cup rail holder made with stainless steel brackets. Hi Leon Yes, just arrived back from overseas yesterday to find your beautifully crafted sheoak R58 “bits” had been delivered and I am very happy with your excellent craftsmanship. Hi Leon! Got the parts today and have to say I absolutely love them and my Fiancé now understands what I was talking about?? Thanks again for your time on these I really appreciate it. 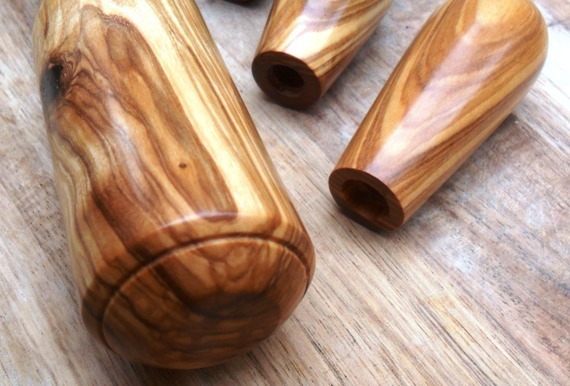 The wood is beautiful and the craftsmanship is high quality!! This is a custom handle for an unconventional size Portafilter. Leon went above and beyond to make sure he could accomplish what I was looking for. Sensational stuff Leon Beautiful grain. Thankyou very much. Hi Leon! The handle arrived at the end of the month (just in time for the New Year)! It actually received the day after I returned from a ski trip, so perfect timing. Btw, it looks beautiful. Thank you so much! Hi Leon, I received the packages this morning. I am so excited when I open the box. It is really a surprise gift. I love it very much. Thank you Leon. I got them this morning and they look great. The tamper is so much easier to use than the one from Breville to and fits my portafilter even better than the original. Thanks, and thanks for the awesome work! Hi Leon, The parts look amazing! They look and feel like premium-quality and the package you made was cushioned perfectly. One again-thank you very much. Hi Leon, How are things? I swear that my Lambro makes better coffee with the Wilcox additions! Hi Leon, parts have just arrived! you are an artist!. They look fabulous, can’t wait to get them cleared and onto my machine, will send some images when all done, thank you again. Hi Leon, Quick note to say I received the handles this morning. Thanks so much, they look and feel absolutely fantastic as expected!! Leon, The package arrived in the post late yesterday, thanks. The handle is an excellent piece of work, well done! It fits quite firmly on the existing portafilter. Hey Leon, package arrived. They look great!!!!!! 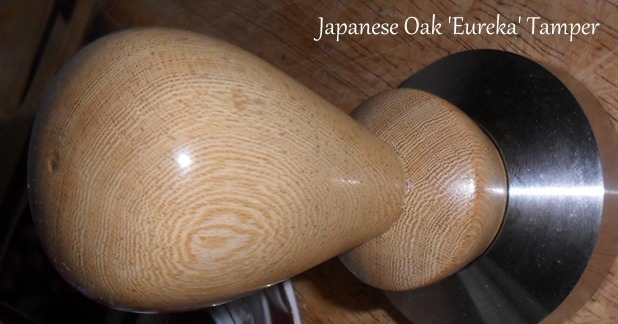 I love the grain in the sheoak. Hi Leon, Just received them and I’m very happy with them. Leon has good workmanship and very friendly/helpful! The handle looks and feel great! Highly recommend. Hi Leon, I just received the package today. They look fantastic I can’t wait to get them onto the machine. I am also planning to get the machine powder coated in a matt black. Again, thanks so much for this. Hi Leon, I have received the parts and fitted them. They all fit perfectly and the feel of them is amazing compared to the plastic originals. Thank you very much! Good grip, soft to the touch. I love it! Hello Leon, Absolutely beautiful! I almost wish I ordered the tamper as well now. Again, beautiful work. Leon, I am impressed with the workmanship. They look great! Thanks again. 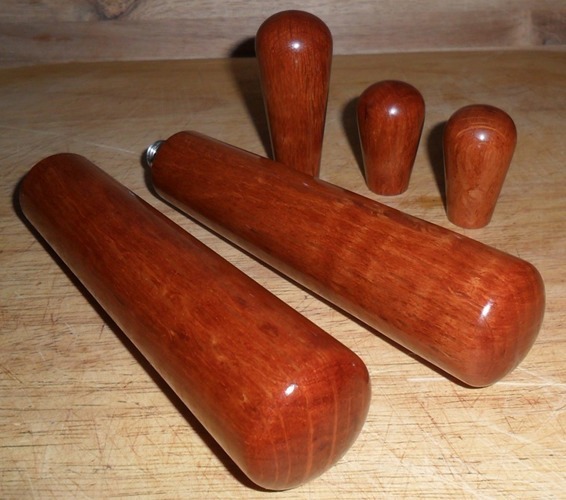 Hi Leon, The handles have arrived and they are excellent. I am very pleased with the work you have done for me. Thanks again, your products speak for themselves. Hi Leon ! Even the coffee taste better! I’m, still trying to figure out how you did the ‘star’ handles .. they look machine perfect. Well, thanks again Leon. Hey Leon, The parts are absolutely brilliant!! It is just a joy to have them on the machine they just give such a feeling of warmth! 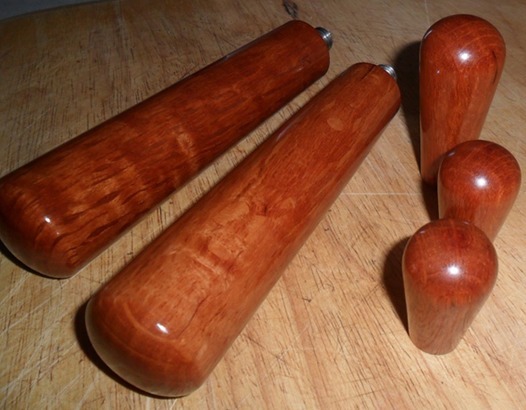 And the tamper is just great, really the right fit for my baskets and the feel is fantastic. Hi Leon The handle looks absolutely beautiful. Thank you once again. Really good quality, really happy with the beer tap handles. Hi Leon. The handle was delivered on Mon and it is a piece of art! Thank you!!! !